From May 8 to 20, for the six consecutive year, the US Championship and the US Women Championship take place at the Chess Club and Scholastic Center in Saint Louis. GM Gata Kamsky defends his title, while recently anointed Grandmaster Irina Krush looks for her sixth title in the Women Championship. 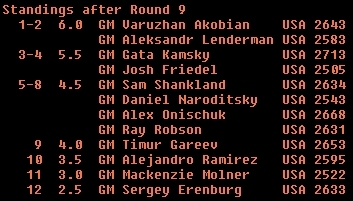 The lineup is quite interesting, with Gata Kamsky, Timur Gareev, Alexander Onischuk, Varuzhan Akobian, Sergey Erenburg, Ray Robson, Sam Shankland, Aleksandr Lenderman, Alejandro Ramirez, Mackenzie Molner, Daniel Naroditsky and Josh Friedel. ICC follows the Championship relaying the games and with a Game Of the Day Service; GM Ronen Har-Zvi is our man in Havana err... I mean in St. Louis; Ronen keeps us up-to-date with a daily recap video. Play starts at 2 p.m. EDT (New York). A much needed rest day for the boys at the U.S. Championship, after 7 rounds of hard fought games. 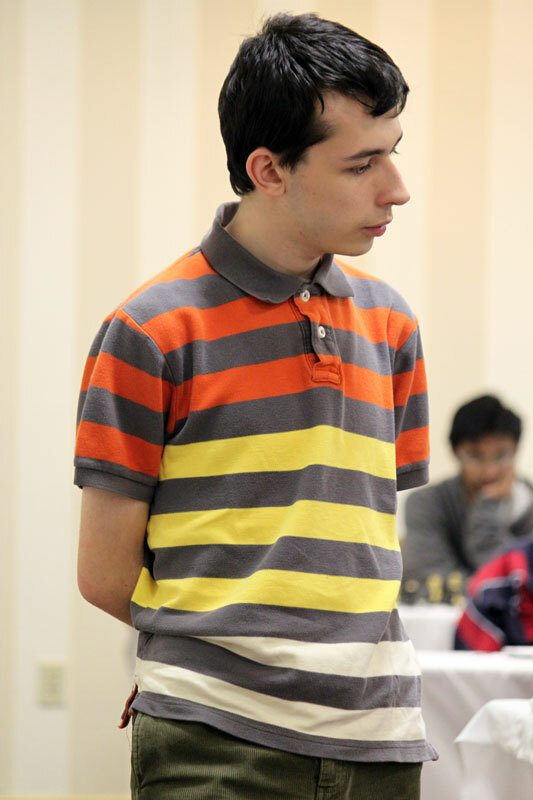 After 5 rounds, surprising everyone, GM Aleksandr Lenderman was leading solo, with 3 wins and 2 draws. Most everyone expected Gata Kamsky - the defending champion - and Timur Gareev, to make this year Championship a two-men race, but while Kamsky was trying to find his best form and Gareev had his ups and downs, the young GM from Brooklyn took the lead. But then Lenderman lost two games, to Kamsky and Shankland, whereas ICC's commentator Varuzhan Akobian managed to win 3 games in a row, climbing to the top of the standings. Varuzhan is playing very solid chess, and with 4 rounds to go, he's for sure one of the favorites to win this year's title. Kamsky, who is playing much more convincingly now, is only half a point behind Akobian, with 4.5 out of 7; then we have the chasing pack at 4/7 with Onischuk, Naroditsky, Friedel and Lenderman. 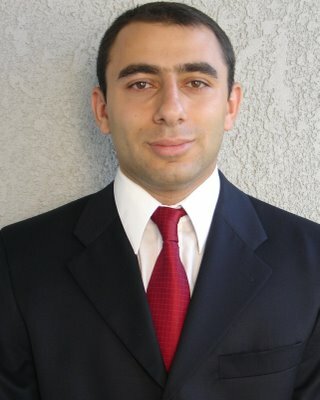 In round 10 Akobian - with white - will play Kamsky, in a most likely decisive encounter. The last 4 rounds will be thrilling to follow! The U.S. women Championship is proving to be an interesting event as well. In the last years, two players have been sharing the laurels: GM Irina Krush and IM Anna Zatonskih. This year it seems like the trend won't change: after 6 rounds Anna Zatonskih leads by half a point, followed by Irina Krush. With 3 rounds to go, the battle for the title is open and exciting. Varuzhan Akobian wins again, for the 4th time in a row! In round 8, with Kamsky drawing his game against Naroditsky, Var consolidates his leadership: now he's a full point ahead the chasing duo; Lenderman went back to win, after two losses in a row, and now shares second with the defending Champion. The ladies played Round 7 today, and Anna Zatonskih won her game against Melehina, whereas Irina Krush was forced to a draw by Foisor. Zatonskih now leads by a ful lpoint, with two rounds to go. What a round! 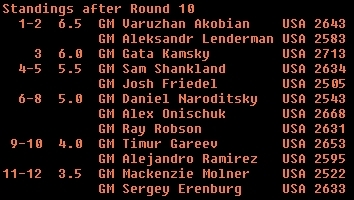 The "leader-killah" Sam Shankland beats Varuzhan Akobian; Kamsky draws his game and Lenderman wins again. 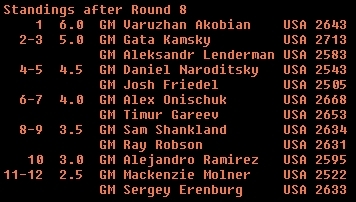 Now Lenderman and Akobian are tied for first, with Kamsky and the "surprise" GM Friedel following half a point behind. 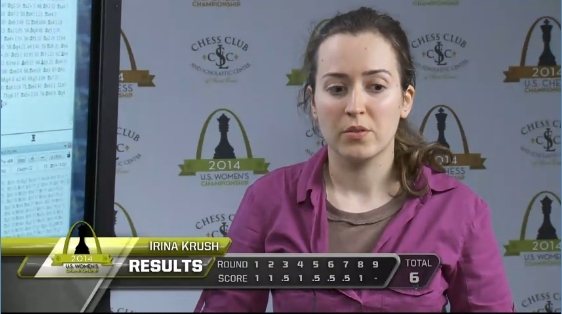 In the Women section, Irina Krush wins the uber-important game with Anna Zatonskih, and now the two multi-winner strong players are tied for first, with one round to go. Round 10 was rather uneventful, as for the guys on top of the standings. 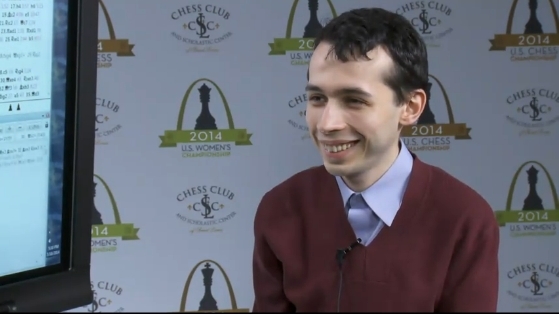 Akobian and Kamsky drew what could have been a decisive game for the final outcome, and Lenderman drew with Molner. Shankland won again, and now ties for 3rd with Friedel. With one round to go, the 2014 U.S. Championshipis a three men business. Last round will see again a very important matcup, with Lenderman playing White vs. Akobian; Kamsky plays Friedel, who is the 'suprise' of this event. In the Women section, after a rest day, 9th and last round is going to be thrilling, with the two queens ties for first. Krush plays Black vs. Ni, and zatonskih plays White vs. Nemcova. This year, we could have both Men and Women go to the tiebreaks ehich, if needed, will take place Tuesday May the 20th. Last round proved to be really exciting. 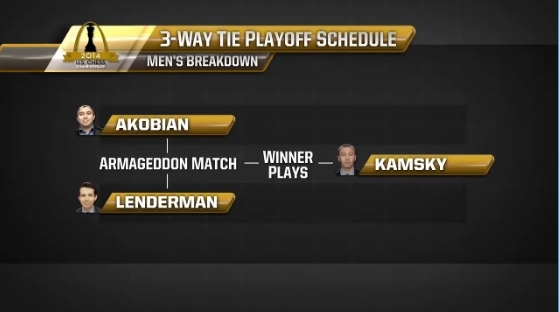 Akobian and Lenderman drew their game, and Kamsky won, going to a three-way playoff. 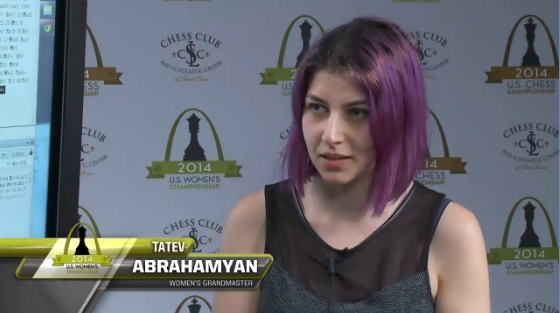 In the Women event, Tatev Abrahamyan won her game, whereas Krush and Zatonskih dreww theirs; agaion a three-way playoff! Kamsky has better tiebreaks, so he will wait for Lenderman and Akobian to play an Armageddon game. The two players will bid to decide who plays Black, and gets draw odds. In the Women event, Krush has the better tiebreaks, so she will wait to know her opponent while Zatonskih and Abrahamyan plays the Armageddon game. The 2014 U.S. Champions are GM Gata Kamsky and GM Irina Krush! Lenderman lost to Akobian in the initial Armageddon game to decide who was Kamsky's opponent for the final two rapid games. Akobian then went on to play Kamsky in a mini-match of two 25 + 5 Rapid games. the first Rapid was a draw, but Kamsky played very well the second game, and won, to grab his 5th title. In the Women's Championship, Abrahamyan played very well, and drew anna Zatonskih in the Armageddon game (she had black and draw odds). Unfortunately for her, she lost the first rapid game against Irina, who managed to easily draw the second game, winning the tournament. ICC is covering the event with GOTD video service by our man at Havana, GM Ronen "Indiana-Jones" Har-Zvi; ICC is a proud collaborator of the event, providing the analysis board to the commentators. You can follow the LIVE commentary with GM Yasser Seirawan, WGM Jennifer Shahade and GM Maurice Ashley directly in your client!